The highway roads to Canacona are scenic with massive rains trees lining the road on either side. On a chicane we see some young girls walking trying to sell pineapples on the side of the highway. These girls thread along an off road path and hit the highway with their produce. They explain to us how their hamlet is in the middle of the forest and hence the Forest Department has denied them a main road. “Connectivity issues forces the villages to have an erratic supply of LPG, water and electricity at Caju Mol, Morpilla. There isn’t even phone network in the village and hence youngsters like him can’t even get calls for employment opportunities. So bad is the state of this little village with about 200 homes,” stated Sanjay. Here people had small land holdings and now families have grown. People here are mostly into the business of cashew extraction to make Urrack and Feni and sell to suppliers but no funds, no money to buy additional land and no connectivity to find potential customers makes life really hard for these villagers of Caju Mol. 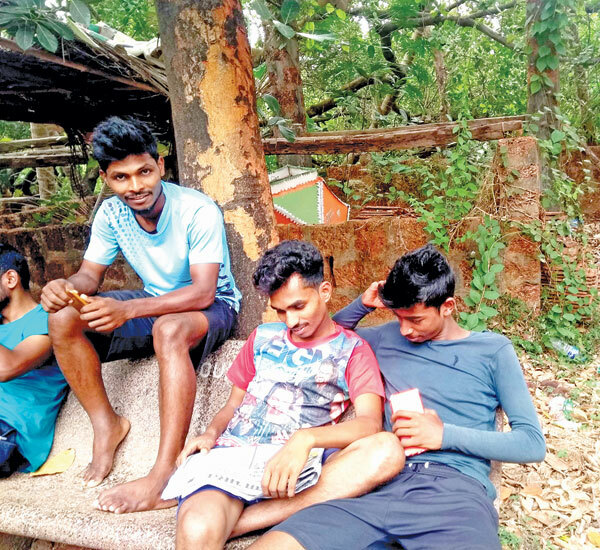 Krishna Gaonkar quit his job at Margao because of low pay and is unemployed at Caju Mol, Morpilla and while he asks anybody to find him a job in Cuncolim and Margao. Krishna explains to us that it’s very difficult to commute in the darkness on the off road which doesn’t even have street lights due to which girls are not allowed to work outside the hamlet. The village elders at Caju Mol, Morpilla explain to us that multiple MLAs filled dreams and aspiration in the local youth but only exploited the youngsters and till date has done nothing for their up liftman. While they have to travel as far as Cuncolim because of the lack of a college or any other professional course in Morpilla.